How many of us spend our days pursuing the subjects we truly love? I’m talking real academic passion: waking up excited for class, looking forward to work, dreaming about future assignments, an “I eat sleep and breathe what I do” kind of passion. I can certainly confirm: The only thing I retained from a few classes freshman fall was a desire to stay as far away from certain subjects as possible. Enthusiasm in the face of heavy course loads is a rarity. But as a senior, I can appreciate now how exciting it must have been to devote so much time to one’s own creative endeavors during college. Dartmouth is not an art school, but its resources are undeniably far-reaching, and the fact that my photography teacher’s work has been exhibited in the Museum of Modern Art is pretty much all I need to know. For this issue, I spoke with three senior studio art majors, all of whom are hard at work on pieces for the department-wide exhibition in May. Lucy Li ’19 seems like one of those people who doesn’t just “do” art — she embodies it. I met with Li while she worked on the top floor of the Black Family Visual Arts Center, alone for the afternoon in an empty studio. All the lights had been shut off except for what looked like a drawing of a leafy plant glowing from a projector on the wall. When I walked in, Li was standing in front of an enormous canvas, which was blank besides some lines of red leaves. For Li, creativity is a constant endeavor; there is a thin line between art and life. For her senior seminar, Li said she is still contemplating what she hopes to convey through her finished work, but some ideas are taking shape. “We had an outside evaluator come in last term who described my paintings as ‘haptic,’” Li said, which made sense. As she described her projects, I couldn’t help but visualize her pieces in a way that made them seem visceral, almost tactile — colorful feminine figures melding and blending with nature, flowers pressed and layered over arrangements of photographs, landscapes drawn from the lines and curves in a friend’s portrait. “I’m trying to explore and show the female form without the social stigma that we put on it — being overly sexualized or serving a certain purpose,” she explained. The way Li characterized her work reminded me of the late Francesca Woodman’s conceptually feminist, experimental self-portraits, with their emphasis on sensuality and marked departures from traditional depictions of the feminine body. Li notes how it’s important to appreciate the female form as a wonder of nature in itself, as something beautiful. Still, she said she wanted her audience to feel free to create their own interpretations. Kealy Brown ’19 is working on a project that will combine themes from her two majors: studio art and biological anthropology. Her exploration of the subject was prompted by reflections during a human osteology class, where she had the chance to look at real human bones. Her book will feature medically-phtographed skulls, with anthropological nomenclature for identification. Brown has also used photography as a medium to explore the relationship between life and death in her past works. For SART 75, “Photography III,” she said she created a series of nighttime landscapes. The photographs communicated a sense of a journey through time. 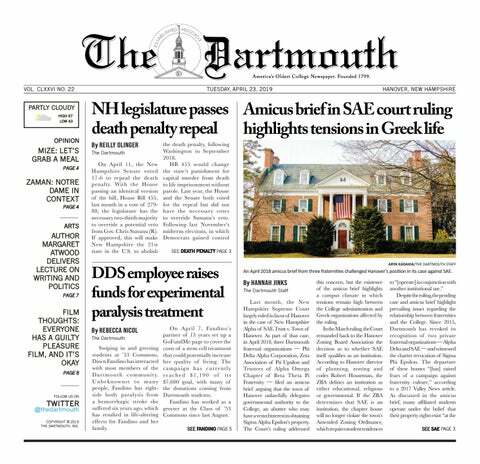 Raleigh Nesbitt ’19 was crowned winner of Dartmouth Idol last month. In addition to being a musician, Nesbitt is also a visual artist and studio art major. When I run into her on campus, she’s invariably carrying a guitar case or a giant sketchpad. The latter, she notes, is an inextricable part of her artistic process. “I guess it just challenges the physical status role of how an artist is supposed to work in a studio, with paint or with whatever expensive material you have,” Nesbitt said. Nesbitt wants to challenge this status quo. For her senior project, she will be working with colored pencil. As an artist who will draw on themes of freedom and liberation for her senior project, she emphasized a newfound harmony between materiality and the conceptual nature of her work. Working in a medium that is affordable and accessible — not to mention portable — provides its own deliverance from rigid guidelines and expectations, she said. “I think that being free in my creative process conceptually affects the way that I think about and illustrate what I think about freedom and liberation,” Nesbitt said. Li is a former member of The Dartmouth Senior Staff.